Are you ready to remodel your kitchen? We are excited to share with you how to design a kitchen like a pro! Although HGTV calls the kitchen “one of the most complicated remodeling projects,” kitchen design can be just as daunting for those of you who are building new! These tips from our Studio 76 Kitchens & Baths design professionals will help you through the design process. Whether you are building new or remodeling your old kitchen, the best place to start is with these five design principles to guide you in how to design a kitchen like a pro. Setting priorities will help you achieve your goals while maintaining a budget. Without priorities, you may not get the value you would expect from your new build or remodeled kitchen. What is most important to you: An enlarged space? Granite or quartz countertops? All-wood cabinets? Professional appliances? New windows? A deeper sink? Better storage? Stone flooring? If, for example, enlarging your space by removing a wall is your top priority, then adjust your next priorities to maintain your budget. Get online. Go to Houzz.com and search styles such as “traditional” or “transitional” or “contemporary.” Look at cabinet styles, flooring materials, special storage features. Get specific about a picture and save it to your “ideabook” noting what you like and dislike about that particular kitchen. While you are on Houzz, read reviews of products and professionals. Finally, don’t forget to check Pinterest and HGTV for more kitchen products, styles, and design ideas. Visit kitchen showrooms. It is great when a homeowner calls and asks about touring our showroom! Seeing and touching samples of kitchen products in person can be pivotal for the decision-making process. Make a consultation appointment with a kitchen designer. Just talking with a professional for an hour will give you great insights on how to proceed, what pitfalls to avoid, and what a realistic budget is for the scope of work you want done. In the photo below, a client had a wall removed between the kitchen and eating area creating an enlarged open floor plan. Think about your kitchen habits and how you and your family “live” in your kitchen. Space planning incorporates the way you and your family work and live in your kitchen. Leave space for doorways, entryways, walkways: 36”-48” makes for good entry widths and walking space. Think work zones: cooking, cleaning, storage, entertaining, and multitasking. Maybe you are a two-cook family. Space planning can handle that. Pair the sink and dishwasher: flank your sink with at least 24” of countertop on one side (install the dishwasher under that countertop) then balance it with 15”-18” or more of countertop on the other side. Consider seating: If your countertop is going to double as a seating area, you’ll need 24”-30” of space per person for comfort. The depth of the overhang should be a minimum of 12”. Be sure the overhang is supported properly. Important, but often overlooked, is safety in design. For small children, consider safety locks on certain doors and drawers. 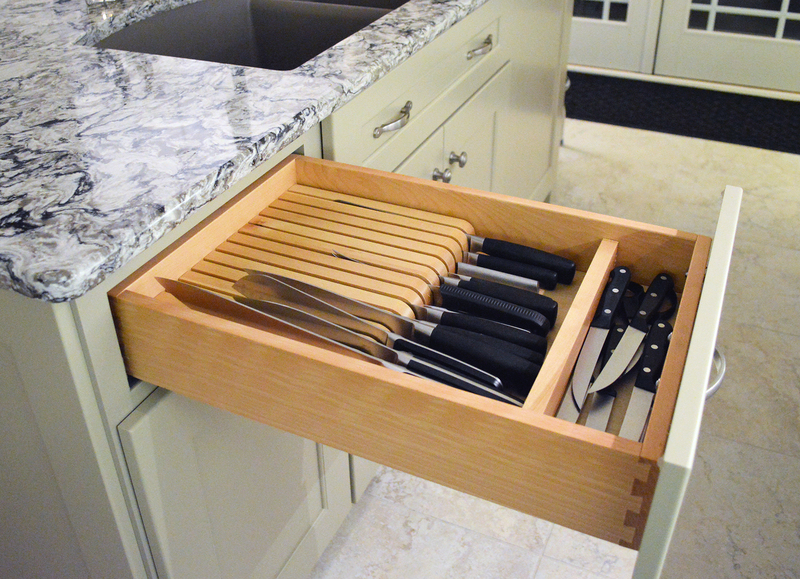 Instead of knives on the counters, consider knife storage in a drawer–and consider locking it. “Soften” countertop corners by rounding or clipping those corners. Save your hips! Good ventilation can free the air of fumes, odors, steam, and grease. Best Range Hoods has a variety of sizes and styles that look gorgeous while getting the job done. When the hood takes air out, the make-up air is coming from somewhere. It is best to plan and redirect that make-up air instead of it coming from a path of least resistance, such as your fireplace chimney. With all the latest cabinetry and drawer storage solutions, you probably won’t regret splurging on a few modern accessories. This homeowner’s farmhouse kitchen was a rustic remodel; however, rustic didn’t mean she needed to live in the past! 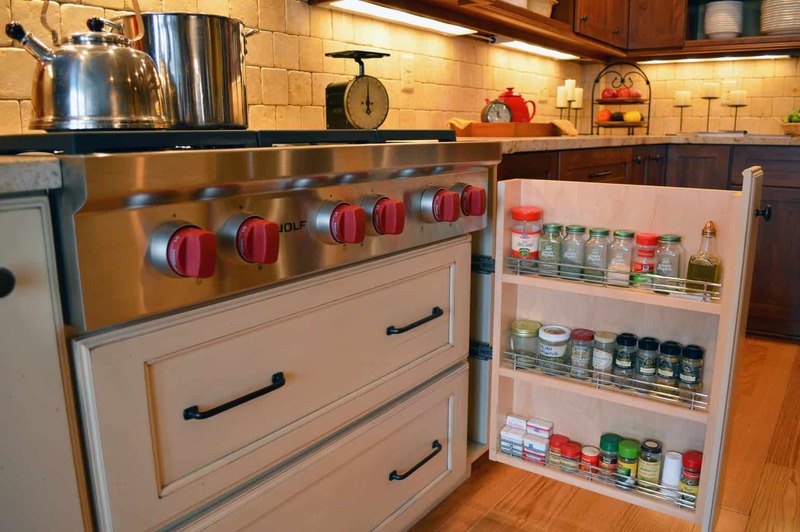 She chose to splurge on open shelving, pull-out spice racks, and extra-wide drawers for utensils. During this time of planning, HGTV may seem like your best friend. But they don’t do the work for you. You have to get out there and create your design boards! Don’t worry, it’ll be easier than you think. Wherever you visit a store, ask if there are small samples you could purchase to begin collecting items for your overall kitchen design. Pull together a collection of paint samples, fabric scrap samples, finish and flooring samples, photos of lighting, and of course small chunks of countertop. This board you create will help you tell your “design story” to the kitchen designer you choose to work with. 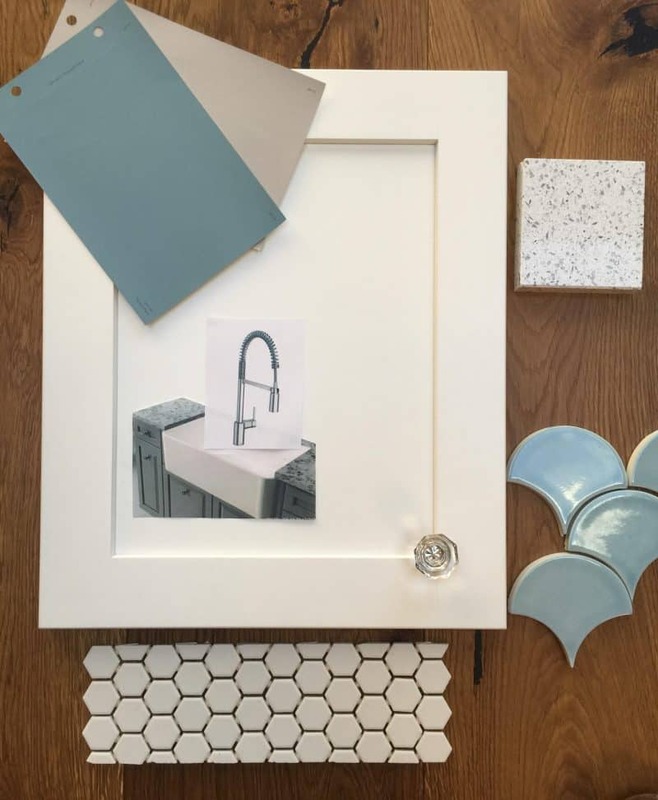 Every time you look at your design board, it will remind you of what you truly love about your color pattern and kitchen décor. With all the details involved in kitchen design, it truly can feel like a complicated process! But if you keep in mind these five principles, you will be well prepared when it comes time to retain a kitchen remodeling professional. Planning for priorities, space, safety and organization (plus creating a design board) is how to design a kitchen like a pro.